Five years after the earthquake, a report from international aid agency ActionAid reveals how a US-backed industrial park, paid for with disaster relief funding, has evicted food-producing farmers from their land in Haiti. 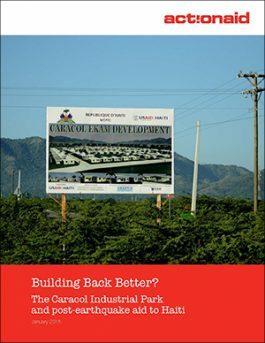 This report shows how more than US$170 million of US emergency aid money to Haiti was used to finance the Caracol Industrial Park, which was built on prime agricultural land in northern Haiti, far outside the disaster zone. More than 366 families and 720 agricultural workers lost their land and livelihoods with only a few days’ notice to make way for the park.